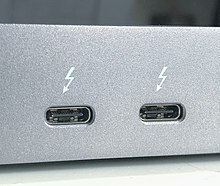 Thunderbolt combines PCI Express (PCIe) and DisplayPort (DP) into two serial signals,   and additionally provides DC power, all in one cable. Up to six peripherals may be supported by one connector through various topologies. ^ Frakes, Dan (February 24, 2011). "What you need to know about Thunderbolt". MacWorld. Retrieved April 17, 2019. ^ Smith, Mat (2012-05-21). "ASUS and MSI launch Thunderbolt motherboards, tie for first place". Engadget. ^ "Video Creation Bolts Ahead – Intel's Thunderbolt™ 2 Doubles Bandwidth, Enabling 4K Video Transfer & Display". Intel. 2013-06-04. ^ MacBook pro with retina display updated with latest processors, faster graphics, longer battery life (press release), Apple, 2012-10-23 . 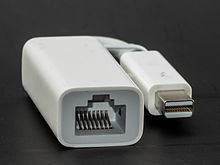 ^ "Thunderbolt™ 3 – The USB-C That Does It All | Thunderbolt Technology Community". thunderbolttechnology.net. Retrieved 2015-11-24. ^ Lilly, Paul (2018-07-30). "Complex Threadripper hack gets Intel's Thunderbolt 3 working on AMD hardware". PC Gamer. Retrieved 2019-02-20. 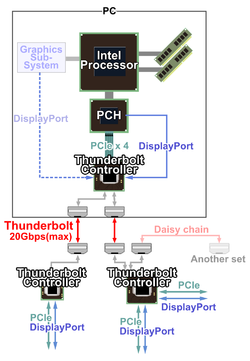 ^ "Thunderbolt how it works". Intel. 2014. Archived from the original on 2014-10-29. Retrieved 1 May 2018. ^ "About the security content of OS X Yosemite v10.10.2 and Security Update 2015-001". Apple. 2015-02-04.